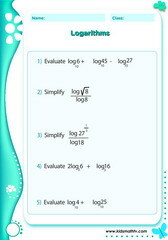 Algebra II worksheets for children in 6th and 7th grades. Get extra practice on expansion and factorization, linear equations, logarithms, remainder theorem, making the subject of the formula and more. Each sheet is in PDF format and can be downloaded at any time. They can be printed as many times as possible depending on the size of your class or your needs as a parent. 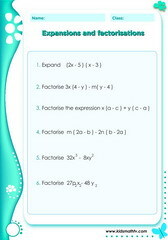 Practice Expansions factorisations with this worksheet. Practice Linear equations with this worksheet. Practice Logs with this worksheet. Practice Order of operations with this worksheet. 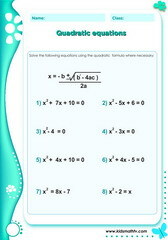 Practice Quadratic formular with this worksheet. Practice Remainder theorem with this worksheet. 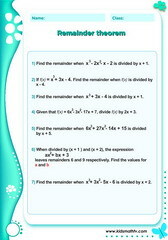 Practice Simultaneous equations with this worksheet. 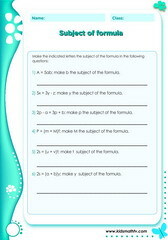 Practice Subject of formula with this worksheet.